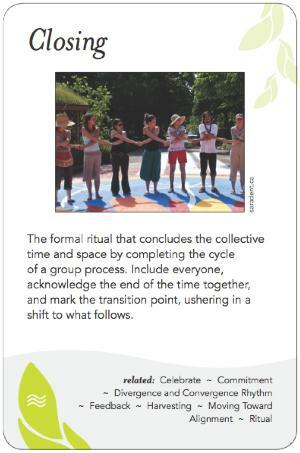 The formal ritual that concludes the collective time and space by completing the cycle of a group process. Include everyone, acknowledge the end of the time together and mark the transition point, ushering in a shift to what follows. Openings and Closings are bookends that hold both ends of the time shared together. They open and close, respectively, the containers of time and space set aside for the event. Each group process gathering, especially of the multi-day variety, has an opening and closing for the overall time; and within that time there are little closings like before a lunch break and little openings like after a lunch break. Each day also has its own opening and closing. Within an overall process each method, activity or time segment also has its own opening and closing. For events that are not limited to one physical space or set time period, there are "big" openings and "big" closings that bookend large group process arcs - often of the multi-year or multi-month variety. Energetically a good closing has space for connecting in some way to what has unfolded in the group time since the opening, and space to ground the group in the now of the moment and then look forward to the time that will be coming next. It creates an opportunity for consious shift from one space/time to another. And every closing is an opening to something else. Closings are often marked by a "letting go" ritual, a construction to help participants transition out to whatever comes next. Time markers, clocks, bells, gongs, breathing exercises and other oral or visual markers can be used to announce and recognize a closing. They must provide space, breathing room, before moving on to what's next. Space at the closing should be held for songs, appreciations, cheers and tears as may be appropriate. Closings should provide time for (either as part of the closing or afterwards) personal farewells, acknowledgements of the importance of relationships that have been made, and that there may be a sense of loss at parting, or a sense of mystery about what comes next. They should recognize and reflect the arcs and curves of energy flowing through the group, allow any particular legacy or meaningfulness of the session to be remarked upon and acknowledged, reflect back on the intention of the sesson and whether it has been fulfilled, and provide a sense of completion. Each session, and especially the final session in an event (which is often poignant and often the most productive of the event), may have an intuitive period, question mark, exclamation mark or semi-colon at the end of it, that may be recognized by the facilitator. People often remember the closing of a session more than any other part, so it is essential that it be handled well. Well-constructed and implemented closings lead to a feeling of successful convergence, satisfaction and fulfillment at the end of events. It is important not to mistake the ending of exercises with the "closing" of a whole group process. Report-outs, next-step assignments, harvesting, feedback, and meeting evaluation should not be done as part of a closing. Be aware of activities, breaks and time blocks (e.g. at the end of each day) within an event, and the need for proper closings (and openings) for each. This is analagous to ensuring that you close all parentheses you open when you are writing, especially if they may be nested. Beware of the discontinuity created when people are not all leaving at the same time. This can be very disruptive. One way to address it is to do the ritual of closing when everyone is present and then shift to more modular group activity as people trickle out back to the world. Avoid premature closings, which can occur if the event is time-bound, or if not enough time was allowed. In this situation, don't try to wrap up what isn't wrapped up -- be unattached to outcome. As facilitator, it may be necessary to invoke the closing early, e.g. 40 minutes into an hour-long discussion, to ensure sufficient time for completion of sessions and a proper closing. The Future Search story tells us that when we keep something open-ended we keep processing it, and it's only when we have acknowledged its completion that we stop. "The conversation started long before it began and will continue long after it ends." -- assessment at an Art of Hosting symposium hosted by Chris Corrigan.